Hi friends! As you may notice, there has been a bit of spring cleaning around here, so to speak. It felt like time to shift my virtual space, reorganize what I offer and put out in the world, and visually create something that felt a little more connected to ME. So look around, check out the new look, new schedule, new events and let me know what you think! I hope you like this new website as much as I do! I’m also working on some new recordings and content that I feel pretty excited about. Stay up to date and join my mailing list! You’ll get some free goodies each month, as a thank you for staying dedicated to your practice. You’ll also receive discounts on events and first access to enrollment. If you have about 30 - 40 minutes to practice at home, here is a short sequence designed to release the hips, belly, shoulders, and neck, effectively reversing the effects of extended sitting and bringing circulation and vitality back to the body. To practice you will need a mat (or carpeted floor works), a rolled blanket, and a timer. If you use your phone make sure it is in airplane mode so that you won’t be disturbed! Yin yoga works at the level of fascia, connective tissue, joints and bones. Find relaxation in each pose and then hold for longer periods of time to effect the deeper layers of the body. Because the passive stretches are sustained, it’s common for sensation to arise and sometimes intensify. If the sensation is not painful, merely uncomfortable relax into it and observe it. If ever you feel a sharp or sudden pain sensation, back away, modify, or skip the pose. Start by laying on your back, extending your left leg long and hugging your right knee into the chest. Thread the fingers around the knee, then completely relax the arms, legs, entire body. The knee might naturally start to sink to the right, this is fine. Relax here for 1 - 2 minutes. Release the right foot to the ground and scoot the hips slightly to the right. Open the arms wide, into a t-shape. Lift the bent right leg and bring it over to the left side as you roll onto your left hip. Place your rolled blanket under the right knee. Relax the entire body, focus on your exhales, and releasing all tension. Relax here for 3 - 4 minutes. When you are done, go back to the first pose and do both of these on the left side. Bring the soles of the feet together, knees open wide. The arms can be anywhere that feels supportive. If the sensation in the groin and inner thigh area is very intense to the point of causing tension you may want to place blocks or two rolled blankets under the knees or thighs. Relax here for 2 - 3 minutes. Keeping the knees bent, bring the soles of the feet wide and knees rest together. The arms may rest anywhere that is supportive. Feel heaviness and relaxation moving into the feet, legs, pelvis and lower back. Relax here for 1 - 2 minutes. Without rushing, make your way up to all fours and move through some gentle, slow cat-cow. Keeping the hips stacked over the knees, walk the arms and torso forward and allow the forehead to rest on the earth, or a block. If you are quite open and it feels good in the neck, you can draw the shoulders down and rest your chin on the earth instead of the forehead. Relax here for 2 - 3 minutes. Slither forward onto your belly, resting the tops of your feet and bringing forearms down to the earth. Stack the elbows under the shoulder heads. Release all tension, all muscle contraction allowing the spine to melt towards the ground. Gaze can be neutral, or you may rest your forehead on your blanket. Relax here for 4 - 5 minutes. Come into hands and knees and place the blanket across the center of the mat. Slowly lay over it so that the low belly rests against it. The blanket should be across the body somewhere between the hip bones and low ribs. Rest your head on your hands. If you feel any pain or extreme tenderness here, just lay on the floor, in the same way, without the blanket. Relax here for 1 - 2 minutes. Press yourself up to hands and knees. Bring the knees, ankles and lower legs together. Rest your hips on your heels and fold forward, with arms alongside the body, forehead to the ground. You may choose to modify this by bringing a blanket under the forehead or allowing the knees to widen. Relax here for 3 - 4 minutes. Place the rolled blanket under the back, running along the spine and ending at the upper Thorasic spine (right above the upper shoulder blades.) Draw your shoulder blades down your back and extend the arms out to your sides. The head may rest on the floor (more throat opening) or a blanket or pillow (less throat opening.) Legs could be bent or straight here, whichever feels best. Relax here for 4 - 5 minutes. Bring the blanket roll under the hips, running across the body and supporting the sacrum. Extend the legs and arms to the sides. If this causes discomfort or pain in the low back, bend both knees bringing feet to the earth. Relax here for 3 - 4 minutes. Slide the blanket roll under the knees. Create space between the feet and between the arms and the body. Slide the shoulders together and down the back. Relax completely here for 5 - 15 minutes. This is a great time to practice this September’s Yoga Nidra recording! If you have 30 minutes to practice at home, here is a short sequence designed to fire up internal heat, encourage healthy elimination and detoxification, and to release toxins in the form of sweat, breath and unhelpful energies. Before going into these poses warm up with a few minutes of Ujjayi breath and continue this breath throughout your practice. Move through some cat-cow, and several rounds of Surya Namaskar A. 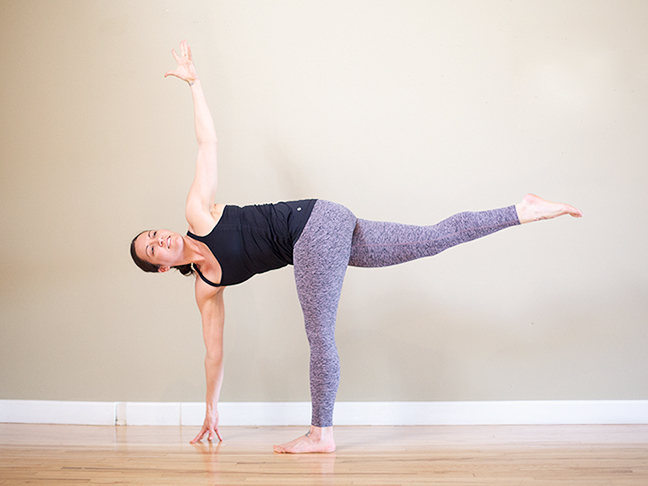 Hold each of these poses for 5 - 10 deep steady breaths, with a connecting Vinyasa or Downward Dog between each side. Follow with poses to cool the body (supine twists, figure 4, supported bridge, happy baby) and finish with seated or Savasana meditation. Note: This is NOT meant to be a beginner series. If you are new to yoga I recommend practicing under the guidance of a teacher. I realize these directions are inconsistent in rights and lefts - my directives match the orientation of the posture in the photo. Feel free to start all on one leg, right or left - or switch back and forth with the directions - just to change it up! Most importantly do both sides. As you breathe become grounded in your seat. Know that this space is yours, this pose is yours, this body is yours. You are taking the place you are meant to and following your own path. No one can walk this path for you, your challenges and successes are uniquely your own. No one can embody your wisdom and you are not meant to be anyone other than who you are. Release the urge to compare yourself with others. With each exhale release comparison. As you breathe feel expansion from heart center all the way through the fingertips. Feel the wobbles and effort in maintaining your twist and balance. Understand you are capable and powerful. You are able to overcome all that is placed before you. You are not meant to be perfect but to fully embody your attributes, flaws, successes, and failures. Understand that trying and working for what you want is already a great win, regardless of the outcome. Understand that things very rarely go the way we expect or plan but we adapt, survive and thrive. Fear is of no use to you on this journey. With each exhale release fear. As you breathe steady your gaze on one fixed point. Be unwavering in your focus even as the pose grows more challenging. Feel everything narrow in and converge. Know that this focus is your potent energy source. You can direct this raw power anywhere you choose. You can direct your energy in ways that sustain and support, rather than dispersing your energy in areas that are unsustainable and weakening. Refine your focal point. Decide where you want to concentrate your power. Let all the noise and nonsense fade away into the periphery. With each exhale release distraction. Maintain your effort and make micro adjustments in response to the wobbles. As you breath observe what arises. Who cares if you fall? Why does it matter that this feels hard? What does it have to do with your vibrant, timeless, radiant, divine soul and self? Nothing. Who cares if it's perfect? Why does it matter if your toe lines up with your hip and your head? What does perfect execution have to do with your value? Nothing. Just be here now. Let go of should. With each exhale release ego. As you balance in this pose feel the dance of sensation and response. Recognize the fluidity and impermanence in all things. Nothing lasts and nothing is meant to. Recognize what is present right now. In each moment. Breathe and be present. With each exhale release attachment. It's spring! I am so ready for these longer, warmer days, more outdoor adventures and lots of fresh greens. Here's a smoothie I've been doing almost daily. Full disclosure it is a little more intense than a green juice, BUT it contains all the fiber of each ingredient making it super beneficial for digestion, elimination and overall radiance. The beauty of this smoothy is that you can substitute different greens and fruits depending on what you have or what you like. It's also quite good with ripe pineapple or mango. I am using dandelion greens right now because they are in season, purify the blood, and provide a large amount of Vitamin K, Vitamin A and much more. They are quite bitter though, so you may want to add more banana or forego completely for more romaine. This recipe is for about 3 servings. Put a couple in Mason jars in the fridge and have a quick morning pick me up on hand. Cram everything into your blender (works best with a high powered blender), pour in water, pulse until everything is just blended and then blend on high until smooth and creamy. First let me say, while I have done juice cleanses, and the master cleanse, this is not that. It's freaking cold here in Colorado right now. We haven't had a day over 30 degrees all week and most mornings we wake to a fresh dusting of snow. This is not the time to live on juice alone. Just the idea of that makes me want to cry. However, it was time to clean up the diet and bring more intention into eating and cooking. It's something that feels right periodically, especially after the holidays, and it always makes me feel better. Intense cleanses and fasts are not for everyone, in fact can be downright harmful for some people, but almost everyone could do with cutting down on sugar and refined food. So that was the basis of this Sadhana: intention, discipline, whole foods, no sugar. The intention was to eat only whole foods, while cutting out alcohol, refined or processed foods, grains, dairy, sugary fruit like bananas, all sweeteners, and to minimize red meat. We basically modified the Whole 30 to suit our diets (I can't not eat legumes), making it slightly less intense and allowing certain foods that supported our health goals. Again, anything too intense would not have worked. Longer cleanses feel the best to me when you are basically eating normally but like the very healthiest version of normal. I recruited Russ to do it with me, because it's soooo hard to be the only person in the house cleansing, and because he too loves dietary reboots. More than one time the fact that he was doing it too kept me from cheating and ordering pasta. So accountability buddy - highly recommend. Preparation is key too. We talked about what our guidelines were, I printed a list of acceptable foods to hang on the fridge and then cleansed our pantry. I threw out all the bread, fake meat, tortillas, chips, crackers and pretty much anything processed, and then spent a ton of money filling our fridge with fresh fruits and veggies, organic meat, and nut milk. Things we kept: coffee in the morning. We have a puppy who does not sleep through the night and needs to be let out multiple times. Giving up caffeine can happen at another time. I did give up cream in the coffee which feels like a major disciplinary win. Also Vega vegan protein powder. Admittedly this is the only slight cheat as it contains stevia - a sweetener. However we both get so much benefit from our morning protein shakes; it seemed like it was weighted more towards the helpful than the harmful. Things that were hard: NO SWEETENER. Honestly there were moments when I felt that juice cleansing was easier. Week 2 was definitely the hardest (we are currently rounding the bend at Day 26) and there were moments when I felt like dark chocolate was an absent friend I missed so badly I wanted to cry. NO COFFEE CREAMER. It took about a week to adjust to almond milk in my coffee. Then it got easier to trick myself into thinking it is comparable (it's not). The other big challenge was eating when I was too tired to cook. During this time I attended an intensive training, taught the final weekend of YTT and then taught an intensive Yoga Nidra Teacher Training. I was exhausted and completely unmotivated to cook after these long days. We got through with a combination of teamwork (Russ cooked) planning & prep (salads created before, etc.) and frittatas. Frittatas are my new favorite go to for when I'm tired and must eat in less than 30 minutes. Things that were good: NO ALCOHOL. I love a glass of red wine in the evening but honestly, the incredible benefits I felt and saw in my energy, appearance, sleep, endocrine function, skin, etc. totally outweigh the pleasure of it. I've decided to make no alcohol a part of my lifestyle indefinitely. NO DAIRY. I think I always underestimate how much dairy I consume and how heavy it makes me feel and look. Out of the two (alcohol & dairy) dairy might actually be harder to give up completely - I love cheese! But I'm going to try to minimize the milk products after the 30 days are over. Another benefit: bringing this much intention into shopping, preparing and eating has made me feel totally reconnected to my diet; nourishing physically but also energetically. Things that got me through: SWEET POTATOES. Oh man. These are like healthy comfort food. I couldn't get enough. (I've included my absolute favorite salad recipe. Even though it's kale it satisfies me like pizza. True story. Something about the savory, sweet, bitter and sour combined. It might be the perfect meal.) PICKLES. Whenever I craved something savory and processed, like potato chips, tacos, snack food etc. I would eat pickles instead. I ate a lot of pickles. PLAINTAINS. So I'm not actually sure if these are allowed on the Whole 30 diet, but I allowed them on ours. Week one, the chips and gauc cravings were ridiculous, so I made Patacones and gaucamole. It's actually way better than chips anyway! It took longer for sure but was worth it. Here's the recipe I used. (I used coconut oil!) TEA. Apple cinnamon, Rose Tulsi, Mint, anything vaguely sweet. ALMOND BUTTER. Self explanatory. This is the first time I've done a cleanse where I've actually wanted it to keep going and going. I feel awesome! My skin has cleared up, I've slimmed down, I feel connected to my food source again, I have a ton more energy, we saved so much money, and my practice feels more embodied. We have 4 days left but have talked about basically continuing along these parameters indefinitely. Except with dark chocolate. I will be bringing back the dark chocolate. Massage the kale with olive oil & salt then let sit while the sweet potato roasts (coated in olive oil, 400 degrees, around 20 minutes). Toss the softened kale with the lemon juice. Top with onions, sweet potato, capers. I like to add a sprinkle of olive oil and lemon juice over the whole thing then toss and devour! Everyone in our house loves this recipe, even the teenage boys, and it could not be simpler or cleaner. Sign up with your email address to receive my very, very FAVORITE recipe from our 30 days of clean eating! New Year's intentions get a bad rap. We all know the stereotype; everyone flocks to the gym in January with the intention of losing weight, but by February it's back to sleeping in and eating crap - another year, another fail. While creating a change in your life can offer challenges, I certainly don't believe that sticking with your intentions is impossible. I LOVE New Year's intentions, and I pride myself on having pretty great success. When I sat down to think about what I do that supports turning my intentions into reality, I saw that there were several things that promoted manifesting my dreams. I want to share them with you in hopes that your 2018 goals are met and your hopes surpassed! Firstly, let's talk about the intentions themselves. Be specific and prolific. In other words a blanket intention to 'be kinder' is hard to quantify and hard to measure. Most big goals require meeting lots of little milestones along the way. So figure out what the key components of the larger goal are and make each one an intention to be met. Make lots of different kind of intentions - some that you know you will take pleasure in achieving, some that are easily doable and support a larger goal, and some big ones that will bring a huge sense of accomplishment. There is something really motivating about a win - so make sure your list has several easy wins on it. In yoga, 'intention' or 'resolve' is Sankalpa; a promise to be kept. This is a promise you keep to yourself, so first and foremost it must matter to you. When forming intentions, make sure that they resonate; that they will be achievable because they're really something important to you, not just something you feel like you need to do. Try them on for size - imagine the feeling you'll have when this intention, or promise, has been fulfilled. If it doesn't land and feel emotionally satisfying - don't prioritize this intention. Spend your time working towards your hearts true desire, that way you'll not only be more motivated, the success will be even more profound. It is easy to create a resolution list, put it away, and then remember it in December. Oops. One key to making intention reality is repetition, repetition, repetition. Put your list in a place where you can look at it and then look at it often. Every week remind yourself of your goals. If there is something that can be done during that week, put it on your to-do list, your calendar, or however you keep track of tasks (if you don't create to-do lists, start - it's pretty helpful). Repeat it mentally or verbally to yourself; when you wake up, beginning, during or ending your yoga practice, and especially when you're feeling lazy. Constantly affirming your goals brings them into your daily life and that is the only place you will meet them. So write, read, speak, sing, think, repeat your intentions! One way to incorporate this repetition into your life in a pretty profound way is through meditation. I mentally refer to the following as my manifestation meditation. To practice, find your comfortable meditation seat, in a quiet space free of distractions (if you have a location you typically meditate in, of course do it there). Close your eyes, take a few deep breaths and allow yourself a few minutes to become calm and steady in body, breath, mind and emotions. Clear your mind of chatter. Then, become aware of the situation, and outcome you are desiring and working towards. Become aware of the missing steps to fulfillment. Then release all thinking, rest only in awareness, the deep awareness of drawing to you what is best and necessary. Feel that, like a magnet, you are drawing in what you are meant to - even if it's not what you intellectually think should happen. Release all thoughts of should, all desires, all small thinking. Feel instead that everything you need is drawing towards you and be open to receive. This is a pretty powerful meditation and I have experienced undeniable results. The key is to let go of your own desires, and trust. The last, and perhaps the most important, component of making your intentions into your reality is good old fashioned work. Yep. If you thought you could just repeat, meditate and let your intentions come to you, you would be mistaken. What's more you'd be cheating yourself of the incredible feeling of accomplishment and success that comes from continuing to dedicate yourself to achieving the life you dream. Make those dreams a reality. Use those to-do lists faithfully and update them weekly, or even daily. Check in consistently on the multitude of small tasks that go into a big goal and make a point, every day, to execute at least one small task. Over time small things add up to big things. Big things become big accomplishments. Don't get down on yourself if you have a less than exemplary day, this is a waste of energy and tends to build up reluctance or defeatism. Instead, take the time to register the things that you did well, the things you'd like to improve upon, then write out your tasks for the next day and move on. My philosophy is - if I put 4 things I want to manifest on my weekly to-do list, and I only get 1 done it's still one win! Execution tends to be a very challenging part, so if you succeed in meeting your intention - celebrate your success! Treat yourself! To celebrate do things like: enjoy time with a good book, take a hot bath, get a pedicure, go on a hike, sleep in late, etc. vs. indulging in "reward" food, or alcohol, which tend to send you backwards - especially if your intention is to eat cleanly, or cut down on drinking. Instead, make the rewards things that are ultimately nourishing on all levels and align with your highest vision for yourself and life. And there it is. Go forth and manifest! I'd love to hear from you if you have other tricks, tips and practices that help you to stay committed, create abundance, and manifest the life you're dreaming of so leave 'em in the comments or message me! Furthermore! If your intention includes things like: investing in yourself, beginning a meditation practice, traveling to another country, taking your yoga practice to the next level, meeting new people, taking a risk, indulging in total relaxation, swimming with dolphins, eating cleanly, or having the adventure of a lifetime, you should probably nab one of the last remaining spots on our Sol de la Soul Retreat. We'll be staying at Xinalani Retreat outside Puerto Vallarta, Mexico. Check the details and register today! Bring In Your Day With Ritual. Let's start with the morning. There are hundreds of resources advocating various morning routines. In the yogic and Ayurvedic traditions this includes waking well before dawn for meditation followed by chanting/recitation of sacred scripture and asana practice. I cannot bring myself to get up that early! But I do believe in the importance of a morning routine; one that includes spiritual nurturing practices as well as physically invigorating ones. Here are some components of morning magic to add in to your early day. Tidy room, tidy mind; elevated energy. Do it right away after you rise and emerge from your rest with the satisfaction of already accomplishing one thing. Illuminate, beautify, and refresh your space. This can be a symbolic as you'd like it to be - an offering to something, someone, or just honoring yourself and the new day. This goes well with lighting of a candle, or could be done separately. Take a moment in a quiet, special place (if you have an altar, meditation corner, or yoga room, these spots are natural energy centers and will bolster your intention and focus) or perhaps outside or in front of an eastern facing window. Feel your intention rising in your heart and then express it outloud with words. You can repeat it as many times as you'd like. Alternately the repetition of mantra or japamala, is a beautiful and potent practice for clearing energy and bringing in the day. Take as much or as little time as you'd like, but begin the day with expression of sound, mantra and intention and I promise you will feel the shift. One immensely beneficial morning practice that I picked up years ago from doing The Artists Way (highly recommend) is doing "morning pages" simply put - writing first thing. The act of writing, whether long or short, can help purge worries, bad dreams, good dreams, get your creative juices flowing, be a place to vent, help develop goals and intentions and generally help clear the mind of clutter. So instead of sipping your coffee or tea while scrolling Instagram, or reading the news first thing in the morning, try writing instead. Don't hold this writing to any standard. Just let it flow, let it out. It's awesome to practice in the beginning of the day. If you have a space in which to practice, this time on your mat can be as long or as short as you'd like. You can incorporate pranayama, asana, mantra, music, intention, prayer, meditation, yoga nidra. On busy days it may be as simple as running through a few rounds of sun salutations followed by pranayama and a few minutes of meditation. On more leisurely days this practice could be two hours! Work within your life parameters. If you prefer to practice in a class setting find a few morning classes you love and become a regular! Whether you follow Ayurvedic guidelines, eat Paleo, enjoy fresh juice, or need something quick on the go; devise a meal plan and create a breakfast that serves up protein, healthy fat, complex carbs, vitamins, nutrients and adaptogens. Give yourself the best sustenance that you can each morning. I love smoothies full of powders and potions as they are full of goodness, easy to make and consume and don't make me overfull for teaching. Here's a recipe. Walk the dog, hike, or just get a few moments of fresh air or light. Pause to enjoy and appreciate the glory of our beautiful mother earth! *DON'T look at your device until some or all of this is done. Trust me, it's better that way. Engaging with the phone spikes your cortisol levels and frankly, wastes time. Blend, pour, then stir in 1/2 tsp of bee pollen. Enjoy! This women's weekend retreat was the very first retreat that I conceived of, created, executed and taught all myself. Honestly, I was so nervous! I went outside of the usual retreat center arrangement and found our lodging myself. I brought on my friend and aaaaamazing cook Julie to cater the morning and evening meals. I scouted both hot springs, and found the perfect fall hike. It had all the components of something I would love... but still - would they like it? Would it be good? Could I manage teaching and taking part in all the adventures? How would the house be? I was nervous! It went so well. Even better than I could have imagined! It was a beautiful bunch of women, the food was amazing, the house was a huge hit and so lovely to stay and practice in, and I think the yoga delivered and intention practices were pretty damn on point. I definitely had a little moment on the porch after everyone had gone. A moment of massive gratitude and appreciation of the absolute beauty of our mountain home. Here are some photos to give a peak of the fun. I'll definitely be doing this one again next year! "The past is always with us. It shapes us - and it can perfect us; if we learn how to use it properly." This is such a potent idea for this particular time. 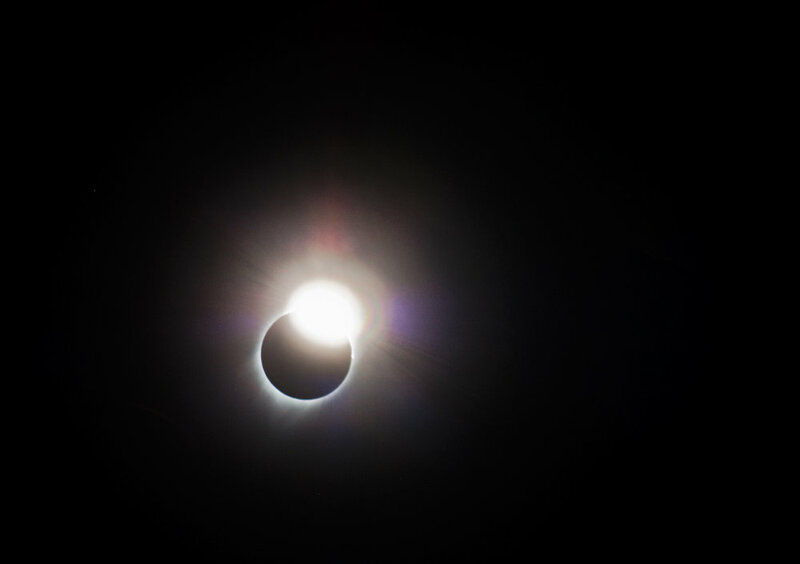 Not only are we collectively confronted with our past, in the recent uprising in Charlottesville and the subsequent neo-nazi rallies planned around the country; we have also just experienced a total solar eclipse - a "resetting of our collective slate" as a friend of mine put it. There is no better time to leave the darkness of our past behind and step forward into the light. There is no better time to shine a light on the darkness of the past and change what we see in our future. The past can be an ugly thing to face, especially our heritage of slavery, racism, oppression, and violence. It becomes painful and alarming when hateful ideas that we thought we'd largely left behind are springing up in our towns and on the news. But our past is still with us and we have to learn from it and use it to grow and improve. The divisive rhetoric of this current administration and the white supremecist groups it's emboldened have vividly brought the worst of our past into our present, showing us that it wasn't really put behind us at all and giving us another opportunity to confront it. Our personal pasts are full of mistakes and misgivings as well. It can be an uncomfortable thing to look at; the past. Full of things we wish we hadn't done or had done, hadn't said or had said, missed opportunities or the same bad decisions over and over. But without studying our pasts we are doomed to repeat our mistakes. Let's start with this question: How can my past perfect my present? Ask this again and again - as it applies to racism, privilege, behaviors, thoughts, judgements, language, and intentions. Let's relentlessly scour our past for the things it's imparted - the things that have shaped us for better or worse and the things that are still with us. I mean this on a personal and collective level. Then let's perfect our present. What can we bring from our past, what values and actions that will improve this moment and hopefully by extension, the future? What needs to be left behind? How can we act in accordance to the answers to these questions? I don't claim to know the answers, but I am ready to continue asking. I believe that's the first step. Those of us who were standing under the sun when it's light was blotted out by the moon felt, in a visceral way, the power of this darkness, the power of the shift from day to sudden night. There were cries and laughter, screams and gasps. Then something even more miraculous happened. After those few moments suspended in darkness - those moments when time and space seemed to shift and turn upside down - the sun returned. Everything was suddenly illuminated once again. After the darkness, the light came back, and when it returned it was warmer, brighter, different. Check out this brief talk, sharing my thoughts on my own yoga teacher trainings, what to consider and some benefits I've experienced/observed in others! To find out more about my upcoming teacher training click here. In an effort to curb my outrageous sugar cravings and beat the scorching heat of my non air-conditioned lifestyle (no AC in the car, no AC in the house, no AC anywhere) I've been formulating healthy sweets, that are also frozen. Frozen sweets. Popcicles. You guys these are so delicious! Here's a sample. Put all the ingredients in a food processor (or high powered blender), blend until completely smooth. Transfer to popcicle molds. Freeze. Eat! Makes about 8 small pops. I love teaching yoga nidra and I ABSOLUTELY love teaching others to become Yoga Nidra guides. I feel so lucky to bring another weekend of learning, practice, conversation, laughter and deeply healing relaxation to Soul Tree. Keep an eye on my Upcoming Events and join me for the next training. It's bliss. Naptime for adults; we do this several times a day! These circles of learning and sharing are always powerful. Every time I feel so humbled to be part of them. The opportunity to practice guiding is an essential part of the training - and also my favorite. I love hearing everyone's soothing voices echoing through the room. It's the best. Another group of incredible teachers and guides are certified and sent out to share the love! Recently a friend and I were talking about one of the great paradoxes of yoga, spirituality and life: How does one balance being present in this moment and unattached, while also planning for the future and taking action to reach future goals? Certainly we are not alone in trying to reconcile the unattachment inherent in a spiritual life with the action required by a life of purpose. It would be a mistake to assume that a spiritual path requires separation from daily life. While one path to enlightenment is withdrawal from the world and living a life of meditation and isolation it is certainly not the only way. But living in the world, functioning in our society, and seeking spiritual evolution is littered with challenges. "Fullfill all your duties; action is better than inaction. Even to maintain your body Arjuna, you are obliged to act. Selfish action imprisons the world. Act selflessly without any thought of personal profit." Krishna introduces the active path of selfless service, or karma yoga. It requires the realization that selfish action is driven by the senses and desire. The wise can rise above selfish desire, recognize their urges and choose right action. This right action is devotion, and becomes an offering to the welfare of the world. When we speak of karma yoga or selfless service it may or may not mean spending ones life in caring for others. Rather it is the full-filling of one's purpose or dharma. A warrior must fight a righteous battle, a singer must sing, a teacher must teach, and all victories, songs, lessons must be offered up to the world and to the divine. This is divine purpose. "They live in freedom who have gone beyond the dualities of life. Competing with no one, they are alike in success and failure and content with whatever comes to them. They are free, without selfish attachments; their minds are fixed in knowledge. They perform all work in the spirit of service, and their karma is dissolved." Yoga, Krishna tells Arjuna, is skill in action. In no small part it is the skill necessary to recognize your own shadow, ego, and motivation and then rise above attachment and act without it. It is the skill necessary to listen to your heart's deepest longing and go wholeheartedly in the direction of it's calling. It is the skill necessary to succeed without glorying in your own success and to fail without pain and doubt. It is the skill necessary to move beyond attraction to the pleasant and aversion to the unpleasant. It is the skill to transcend, to find harmony in the unavoidable, inevitable action of living. And, like the mastery of all skills, it just takes practice. I came across this wisdom yesterday and wanted to share. It's nothing new, in fact it's ancient, but bares repeating. Written thousands of years ago, true is still true. What is your deep driving desire? I know mine and it is definitely not to do harm, quite the opposite. With dedication to ones desire and path must come discipline. Can it be any other way? Recently, I've outlined some rules for myself to keep myself mentally and emotionally strong and focused. I thought they might be of value to others as well so I'm sharing them here. I am not alone, you are not alone. None of us are alone. 1. Listen to hear, not to speak back. Why is this one so hard? I desire to be truly present for what others are voicing, even and especially when I don't understand it. 2. No Facebook, social media or news, before 9am or after 5pm (or longer, as needed). 3. Receive fuel to shine brighter. By being open to the things that bring me joy and fuel my personal fire, I take in what I need to remain strong and dedicated. Giving without receiving is simply burning out. The world needs our light not our ashes; we need to give light - we need to receive light. Not a blind trust in institutions or people I know to be untrue or uncaring, rather trust in the greater scheme of things; life, the world, the universe, etc. Mistrust leads to fear and acting from fear. Where does fear ever get me? 5. "Everything belongs to the Lord"
Another quote from the Upanishads. Nothing is permanent, nothing really belongs to us. Getting attached to outcome will only bring pain. I will give the world my best, not for myself, my ego or my own acqusition, but because it is the way of living that feels the most right. 6. Someone else has it worse. I am incredibly blessed. In times of doubt, fear and darkness I will remember that with gratitude, and pray for those who are truly suffering. 7. How can I be of service? What can I do to ease the suffering of even one person in this world? What can I do to bring joy to even one person in this world? Well friends. It's time to Make America Great Again. It remains to be seen how that will unfold and what is to come. I can say with much confidence though, that if America is to be improved or even maintained WE have to join together in unity and respect and in love to stand up for things that matter to us. Time to stand up for people who are scared, marginalized and threatened. Time to stand up for the planet we love. It is easy to feel fear and despair, but I vote we choose action. Action over agony. We are all people, with so much more in common than in difference. The divisive forces of hate and fear have mobilized. They have always been there but they've been given a powerful and forceful outlet. It's not enough to be a good person anymore; the uniting forces of love and positivity have to mobilize as well. It's time for aggressive positivity. Don't underestimate the power of working locally for environmental change. Small local victories can make a difference. Work with your local city council to create change. Also make your views and wishes known to your elected representatives. Not sure who that is? Click Here. It feels like the summer is blurring by. I blinked and now it's cool again. This was largely due to the fact that I spent most of August sitting inside, at my kitchen table where I sit now, crafting my yoga nidra training. It was an immense outpouring of love, devotion, dedication, concentration, creation, revision, frustration, and excitement. Days ticked by and here I sat, writing and re-writing, formatting and re-formatting; adding and subtracting right up until the very last minute. Then finally it was time! It went so much better than I could have hoped or imagined. I was completely unprepared for how humbling and awesome it would feel to walk around the quiet studio listening to hushed voices guiding each other through this practice. This practice that means so much to me and who's mysterious pull I felt from the very first time I experienced it. I'm doubly sentimental because beyond just the acts of creation and execution, the success, the pride I felt for all those involved; this training was the last step on a journey I started two years ago to evolve and grow as a teacher. I know that larger journey is not over - it's really just beginning, but this training represented alot of effort and growth beyond it's components. "Power is not created by staying safe; power comes from the willingness to leave the world of safety and move forward into the unknown. As we meet challenge it strengthens us by forcing us to grow. Power, like a muscle will not increase by doing nothing."